The new IV Vision Sensor from KEYENCE combines some of the functionality of machine vision and traditional sensors in a single system. KEYENCE engineers have designed a highly versatile, multi-purpose sensor to handle an extremely wide range of difficult presence detection applications. With easy, fast setup, taking approximately only one minute using "Easy Navigation" the IV is ready to tackle difficult detection applications that previously required multiple conventional or proximity sensors to accomplish. The IV's standard equipment including high-intensity illumination, high-performance lenses, and a selection of 8 different sensor heads enables sharp, clear, stable images. 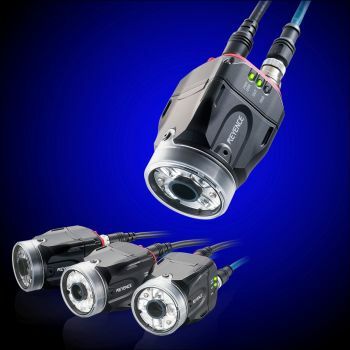 The IV Camera selection includes close, medium and long range models to suit your application requirements. The IV complies with the IP67 enclosure rating, which is based on IEC/JIS standards. It can be used safely in dusty or wet environments. The IV is at home with proven applications in a broad range of manufacturing industries including automotive. Its impressive range of built-in features includes automatic focus, automatic one-touch brightness adjustment, high-performance quad lens and Hi-R illumination. The IV's Navigator software can be used with any PC for quick setup. By simply following the steps on the screen, user setup and operation is complete in less than a minute. A unique Auto Tuning function enables automatic optimization of threshold and parameters to further simplify and reduce setup time. Output adjustment, remote operation, a statistics function and a pattern tool for stable detection add further versatility in the use of this new multi-function sensor. Additional illumination accessories and utilities include an HS-HDR Function, polarizing filters to eliminate glare, Dome Lights and Automatic Brightness Correction.